Asus ZenFone 5z is the latest Android flagship smartphone with AI capabilities from Asus. The design of the device is identical to its predecessor, Asus ZenFone 5. However, the Asus ZenFone 5z has 6.2 inches full HD diaplay having insanly 90 percent screen to body ratio. This is the best budgeted Android Smartphone with latest Qualcomm Snapdragon 845 high performance mobile processor. Asus ZenFone 5z glossy aluminum body makes the overall design looks clean and wonderful from the back of the device which is also a fingerprint magnet. So, you always need to carry a cloth to clean your fingerprints from the device as it easily catches the fingerprint. Full-screen display with notch has become the trend since the release of Apple’s iPhone X last year. With Asus ZenFone 5z, Asus is the latest smart phone manufacturer who has brought the supports for full-Screen display with notch, which is 25 percent smaller than Apple’s iPhone X. Asus ZenFone 5z has minimum bezels to its display with 90 percent screen to the body ratio. Asus ZenFone 5z is an advanced budgeted smartphone with 6GB & 8Gb Ram with 64GB, 128 & 256GB of internal storage starting at Rs, 29,999 (for 6GB RAM & 64GB Internal storage), Rs. 32,999 (with 6GB RAM and 128GB internal storage) & Rs. 36,999 (for 8GB RAM and 256GB internal storage) which you can order directly on Flipkart.com in India. 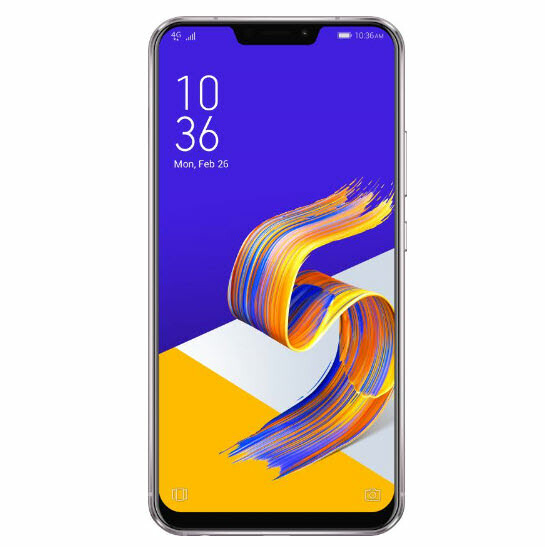 Asus ZenFone 5z is the latest android flagship smart phone from Asus which looks identical to its predecessor Asus ZenFone 5. If you are an international customer, you can place your order for Asus ZenFone 5z from Gearbest.com. Asus ZenFone 5z is powered by New & powerful QUALCOMM Snapdragon 845 mobile processor, Adreno 630 GPU, 6.2 inches IPS LCD with 90 percent screen to body ratio 1080px display, 3300 mAh powered battery, Android 8.0 Oreo operating system with 4,6 & 8GB RAM option and 64, 128 & 256GB of internal storage option. Asus ZenFone 5Z offers dual camera on the back of the device which includes 12 MP & 8 MP secondary cameras with f/1.8 & f/2.2 aperture along with Sony IMAX sensors to add AI capabilities to the camera on the device. Front camera on the device is 8 MP with f/2.0 aperture. According to the Asus, the performance of the Asus ZenFone 5z is increased by 25% in CPU and 30% in GPU over its predecessor. The QUALCOMM latest chipset makes the ZenFone 5z, a camera phone, and it’s the main selling point for this Smartphone. Asus ZenFone 5z is packed with 12 MP primary camera with f/1.8 aperture, Sony latest IMAX 636 sensors with 83 degrees of field of view with both optical & electronic image stabilization. The secondary lens on Asus ZenFone 5z is 8 MP with f/2.2 aperture and supports 120 degrees of field of view. In 2018, more mobile manufacturers are adding support to wide angle photography & AI capabilities to their mobile devices. Camera on the back of the device along with Sony IMAX sensors allows the device to do ton of things that includes dual pixel face detection Autofocus, 5 times higher light sensitivity and more. Front camera on Asus ZenFone 5Z is also 8 MP with f/2 aperture and is also capable of 83 degrees of field of view. Asus ZenFone 5z supports AI scene detection with up to 16 scenes and objectives, which also means that Asus ZenFone 5z is a smartphone with camera that supports true auto-mode. AI scene detection also adds more capabilities for taking night shots by increasing color exposure and sharpness and tunes the scene once camera detects the night shot. In Asus ZenFone 5z, Asus has developed the metal frame around the camera on the back of the device to ensure the alignment with the overall design of the device. AI charging on Asus ZenFone 5z doubles the battery life by not charging your phone at 100% every time. Asus ZenFone 5z charges the 80% of device battery over the night and then extra 20% battery is charged before you awake. Asus ZenFone 5z has lots of AI features However, you should also note that several smart phone manufacturers are also bringing the AI on their Smart devices to make their devices more intelligent. Asus ZenFone 5z has 6.2 Full HD plus with 90 percent screen to body ratio display, which adapts the color temperature automatically. The display on Asus ZenFone 5z is covered with Corning Gorilla Glass 3 for protecting the device diplay from scratches. 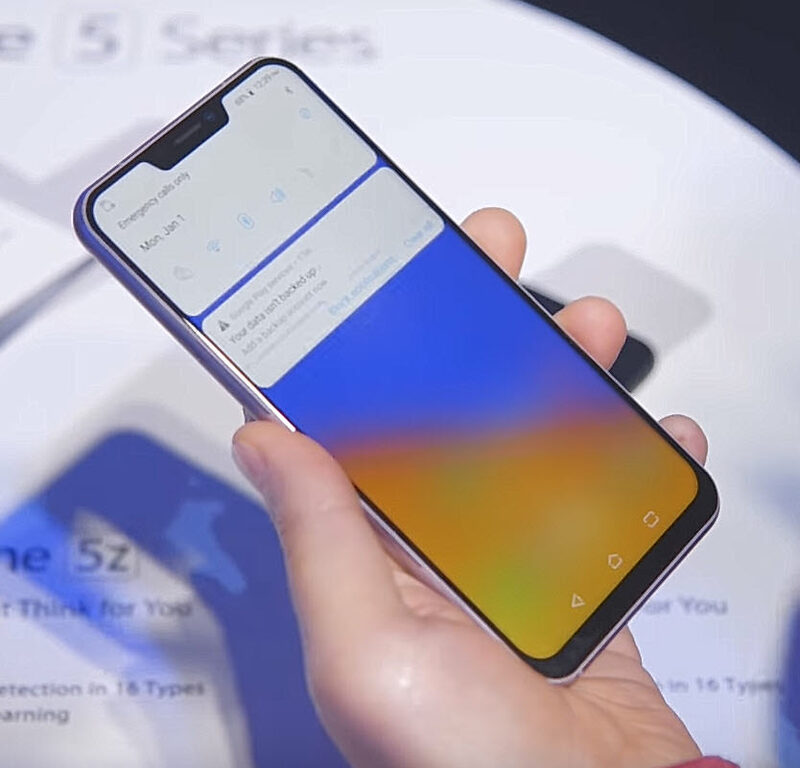 The display on the ZenFone 5z supports the DCI-P3 colour gamut which can be manually switched. Asus ZenFone 5Z has loud dual speakers, supports Bluetooth 5.0, Welcome’s aptX HD., hybrid dual-SIM slot with 4G & VoLTE capabilities, expansion cards support of up to 2TB, dual-band WiFi 802.11ac, NFC, GPS, GLONASS, and BDS. The ZenFone 5z also has support for FM Radio. ZEN UI 5 on Asus ZenFone 5z adds values to the device in terms of overall user experience as compared with other UIs. To improve the overall user experience, Asus ZenFone 5z has very few bloatware in compare to its previous variants. With day day day uses of apps like mails, Whatsapp, video playback, games and phone calls, the Asus ZenFone 5z 3300 mAh powered battery lasts for 11 hours (approx) which is almost identical to OnePlus 6’s battery life. Conclusion: Asus ZenFone 5Z is an overall great Android powered smart phone with latest Google’s Android 8.0 Oreo operating system and Qualcomm Snapdragon 845 high-power mobile processor. From hardware & software perspective, Asus ZenFone 5Z is the great Smartphone with a price which is within the budget.